When our whole family gathers in over Father’s Day weekend, I want to have some fun crafts that work for *kids* from pre- schoolers to 80+. 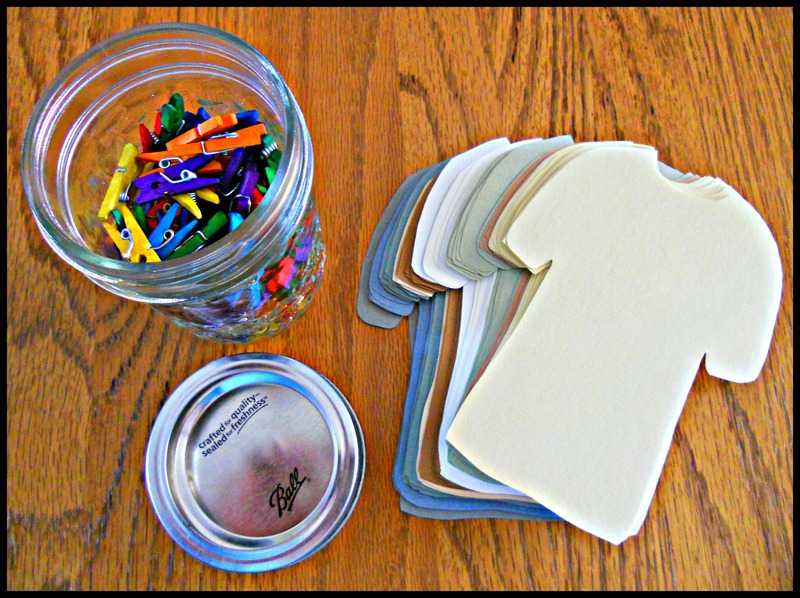 My latest idea is a decoration that everyone helps create—T-shirt garland! To keep everything handy, I decided to make a kit with all the necessary materials. Then I can simply hang some baker’s twine across the windows and we can pin on our paper T-shirts as we “customize” them. To make the kit, I first found an empty box that was just the right size. (This one once held a chocolate cake that came in an order one of our kids sent us from Omaha Steaks . . . yum!!!) 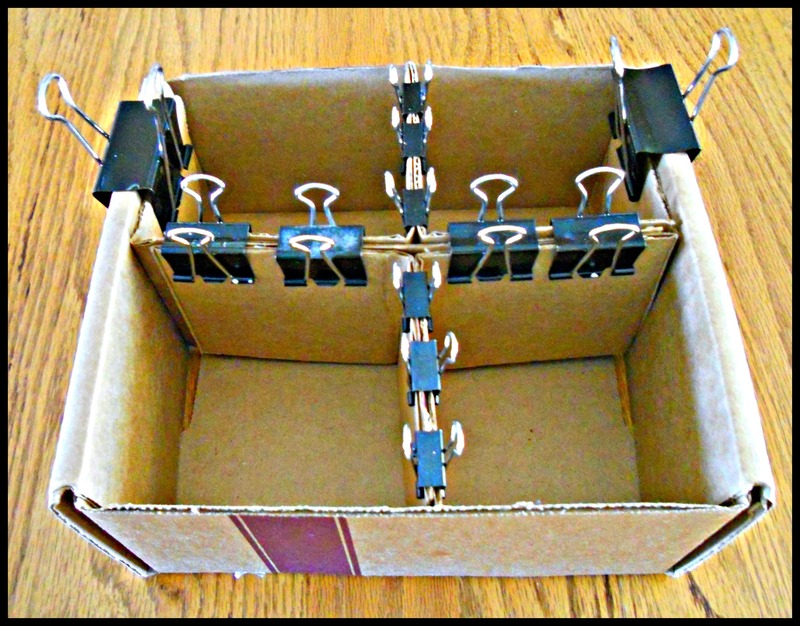 I cut off the lid and then cut, folded, and glued the lid cardboard to divide the box into four compartments. Here it is with clips holding everything in place while it dried. When the inside was ready, I traced around the outsides and covered them with scrapbook paper, then made a simple word-processed label for the front using clip art and a text box. You are wa-a-a-a-ay too clever…..can’t wait to see the creative results!!!! Oooooooh, we’ve had that chocolate cake from Omaha Steaks before and it is way good! Small, but good. Can’t wait to see the finished t-shirts! so fun…everyone likes t-shirts…and to decorate and make a garland of them…how neat is that!…will pass this idea on…and use it too! 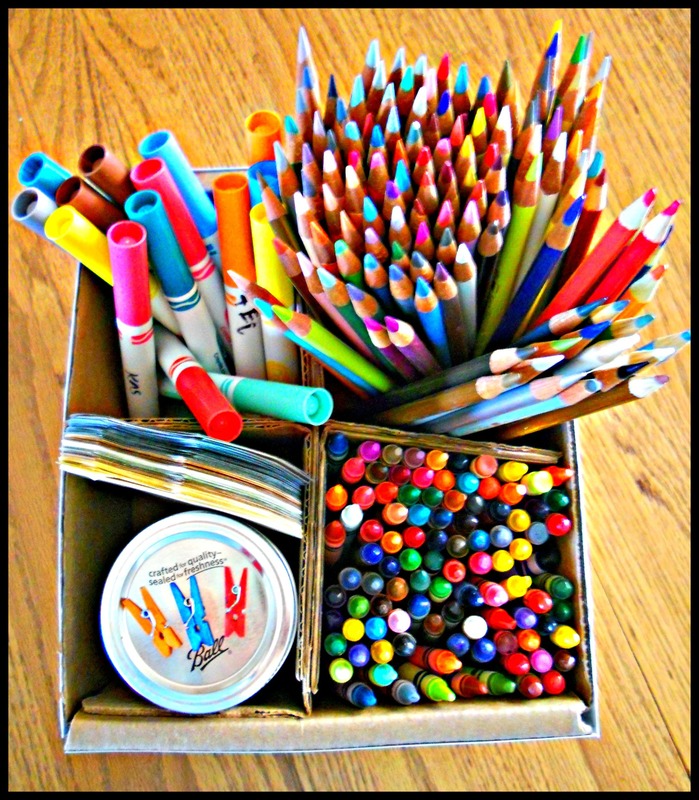 What a wonderful activity for the young and the young at heart – I loved coloring!! I love this idea! This would also be a great kid’s class. Great idea Katherine! Can’t wait to see the finished product. They will have a lovely time with all of this, I’d be very surprised if the adults didn’t get involved too! What a fun activity and it lends itself to many occasions. I am thinking a great holiday party idea! Oh wow, what a fantastic idea!I should make some of those boxes for the voluntary work I do with children…they are so much more practical than the packets we give them at the moment! Great idea! I love that you created an activity that children and adults can both enjoy. Many times when it comes to crafts, people forget about the adults. Your family is so lucky to have you at the helm. The energy you have never ceases to amaze me. Looks like you guys are going to have a wonderful time together thanks to all of your preplanning and creativity. Have a wonderful week, my friend! Sounds like a really cute idea. Can’t wait to see the garland. So cute! These are some lucky kids! Wow! So creative. I fancy making the same craft :). Such a lovely idea. Any chance of a photo of the finished garland once done? 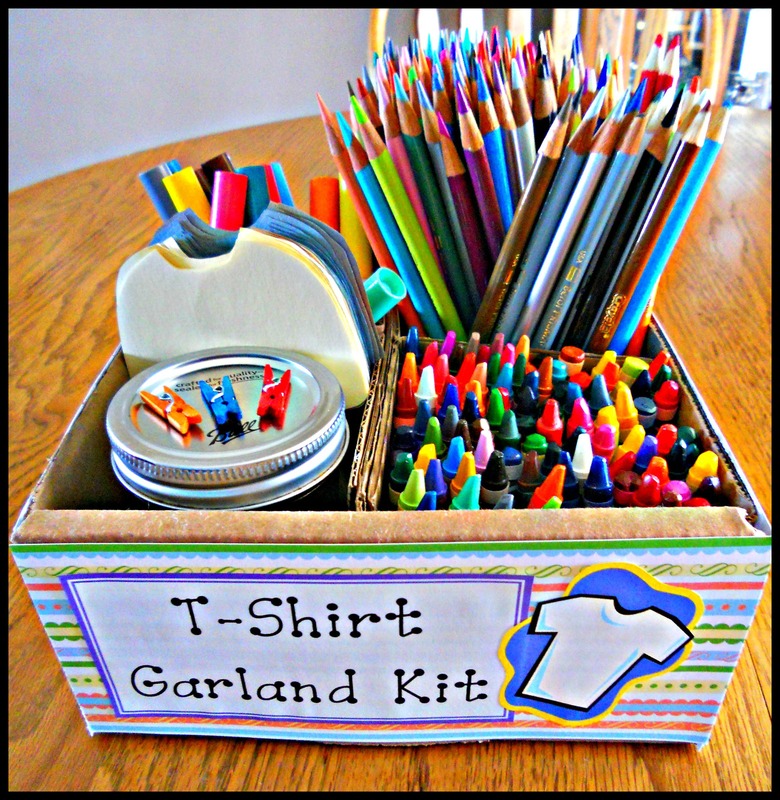 super cute and a great craft camp idea! Such a great idea to bring the family together. Can’t wait to see the final garland. Also, wanted to let you know I nominated you for the Wonderful Team Player Readership Award. You may continue the chain, or just enjoy the nomination. Here are the Rules: http://craftinlightenment.wordpress.com/2013/05/06/what-an-honor/. This is such a clever idea. You’ve executed it beautifully. I can tell how much you enjoy your family. It always shines through. How nice for all of you!